About Jenness > Rising Monarch > RMPTalks > Nessey Tips! “Nessey Tips” were originally little “Tips” that Jenness added in her NESSIPEES cookbook series that were her own “personal tips,” “methods,” and “secrets,” of how she did each recipe. Some were little hints on how to create “her flair” in the recipe, others were just simple practical helps that made the process of baking/cooking it that much easier. Her “Nessey Tip” idea has since evolved into a broader “Nessey-Life-Tips for Life Situations” that she adds into her NewsBlog on a periodic basis (a nod to her first inspirational ‘self-help’ blog that resulted in the Nessipees Series). 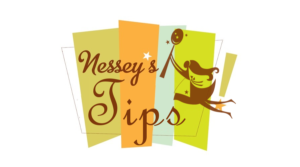 LOGO: The “Nessey Angel” is an original design by Jenness’s Aunt, Dianne Bianchi, to accompany each “Nessey Tip” in Jenness’s Cookbook. Jenness added it to the background label, which is a revision of another of Dianne’s original designs, the “Nessey’s Nuts” Label, which Dianne ALSO made for her niece as a gift and “thank you” for when Jenness sent her one of her Nessipees Favorites: “Nessey’s Texas Spice Nuts,” in bulk as a Birthday Present.